My children were so excited when I opened the neat little bundle that came in the mail. It was another video from Moore Family Films! We have several of their other videos, so they were so thrilled to see that there would be a new one to watch. 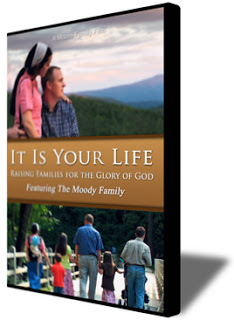 This new DVD the Moores have created is part of their It is Your Life series. This one is It is Your Life: The Moody Family and takes us into the home and hearts of the Moodys, who are a homeschooling family that is all about living for the glory of God. The film features interviews with Mr. and Mrs. Moody and their children, grandparents, and others. The interviews are transparent and show us how the Lord is working in their family, transforming them into His image. Besides the interviews, we are taken along to see the Moodys in their day-to-day life while they interact as a family. The Moody family is a real family. They do not claim perfection which is good because sometimes we can get the impression that other families don't have any problems. But what this film is mostly about is family togetherness and serving the Lord as a family. It is about a family that seeks to serve the Lord in all that they do. It is about a family that loves the Lord and loves each other. Since the Biblical family gets attacked almost everywhere in the media, and at times even by some family, friends, and churches, I am so glad the Moores have put out this new film. You will be inspired as you see that yes, there are really other families that seek to give each area of their lives to the Lord. There are also other important areas covered in the DVD such as caring for elderly parents, the dynamics of large families, chores for children, sibling relationships, biblical reasons for teaching your children at home, and much more! I definitely recommend this video to all Christian families, and it is even great to watch with your children. They will love it too! My children ask to watch the Moore Family Films videos over and over again. Now for the very exciting part! The Moores have generously offered to give away one copy of It is Your Life: The Moody Family to a reader of Blessed Homemaking! Thank you so much to the Moores for providing this DVD and thank you to the Moodys for sharing your lives with us. Please enter through the Rafflecopter form below (it's easy). If you don't have to wait for the giveaway to end, you can purchase it here. I would love to see them all.Children are a blessing film looks really good. I went to the San Antonio Independent Christian Film Festival where this was entered and heard GREAT things! My husband and I have seen two other films by them and loved their productions! Although I didn't get to see this particular film about the Moody family, my friend said it was her favorite of the whole festival. I can't wait to see it! :-) What encouragement to those of us who live this "rare" lifestyle and seek to glorify God in our lives and families. May the Lord bless the Moores, the Moodys and all those like them. I'm glad their stories (testimonies) are being recorded and retold. I would love to see the "It's Your Life" one. We LOVE the Moore Family Films! They are such a blessing. I think I would love any of them, but particularily the most recent you mentioned, The Moody Family! I would love to see the Moody Family DVD! They all look really good. I think they all look like fun. We have seen the Maple Sugar one and enjoyed it. But, you have piqued my interest and I would love to see this video. I have all of their films EXCEPT this one so this is the one I want the most! I have been waiting to get it!!! We don't have TV programming and I'd never heard of them til now. I'm very interested in them and it sounds like they're a great resource for families. Our family just finished watching reruns of Little House on the Prairie, some of my favorite shows of all time. It's important what we watch, and what we watch with our kids. I'd love to win one! We have one of their first films and it's very good. We've just been talking about getting some more wholesome family movies. This would be great to get us started! I'd love to receive the newest movie, The Moody Family. We've watched Children are a Blessing and More than Making Maple Syrup and the one thing that I keep taking away after watching these movies is how much they love each other and how the children interact with each other. It truly amazes me. We have Children Are a Blessing, and love it! Our oldest daughter is five, and it's one of her favorite movies. We've talked about when we have the funds, getting more of their movies. I would like to give the DVD of the Moody family to our daughter and son-in-law. They have just had their sixth child and I think it would be an encouragement to them. Thanks for the drawing; it looks like a great video! Would love to win this. Thank you for doing this giveaway! Thank you for doing this giveaway! I would love to win! we have all 3 other films and desperately want this one! They are all wonderful! The Moody Family DVD. I have all the others and love them!